We have another bakery in Penang has been sealed due to poor management of cleanliness and pest control. Before this we have a similar bakery in Jalan Keramat sealed due to same problem. But this time it's in Kepala Batas. GEORGE TOWN: Another bakery in the state has been sealed after their baking section was found covered with rat droppings. The bakery in Kepala Batas was found to be just as revolting as the “Roti Bengali” outlet in Jalan Dato Keramat here. The outlet’s baking section’s floor was similarly coated with rat droppings. However, no rats were spotted when a 10-man party, led by the State Health Department, raided the bakery in the northern town on the Penang mainland. As a result, the department slapped the operator with a two-week closure order. They also found an industrial fridge with mildew both inside and outside the appliance. Health inspectors found trays of bread dough and other baking items exposed to the fungus. The workers were also not properly clothed and did not use gloves and head covers while on duty. The department’s deputy director (security and food quality division) Ku Nafishah Ku Ariffin said it could not tolerate such offences from a bakery. “As a food processing outlet, its operator must observe the highest standards of hygiene. Having rats scurrying in and around the premises is a big ‘no’. “The discovery of rat droppings is enough for us to book them,” she said. Six bakeries were slapped with the temporary closure order during the day-long checks by the department recently. Two of the bakeries were from Kepala Batas. 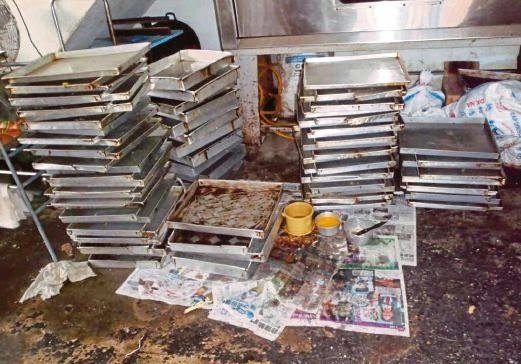 The bakeries were sealed for two weeks after violating Section 32B of the Food Hygiene Regulations, 2009. Also booked under the same section of the regulations were bakeries in George Town, the Seberang Perai Selatan district and the Seberang Perai Tengah District.